At Bishop's Exterior Cleaning we provide render cleaning to residential and commercial customers throughout Dawlish and Devon. Our render cleaning team are fully trained in the use of all the equipment and cleaning solutions they use and are fully insured. Give us a call on either 01626 798 188 or 07938 377 547 to find out more about our render cleaning services in Dawlish and Devon. Residential render cleaning services in Dawlish and throughout Devon. Commercial render cleaning services in Dawlish and throughout Devon. Many buildings up and down the UK have rendered walls these days because of it’s fantastic clean look and because of how cost-effective it is. But, rendered buildings can become dirty and grubby looking over time due to the build-up of organic matter and atmospheric pollutants. This is where our professional render cleaning services come in. Our Dawlish render cleaning team clean rendered buildings throughout Devon week in week out and can bring your building render back to its former glory. You may notice black, green or red stains and marks on your rendered walls. This is due to the build-up of algae and other organic matter. Over time this staining will only get worse if untreated and will eventually spread across all your render. 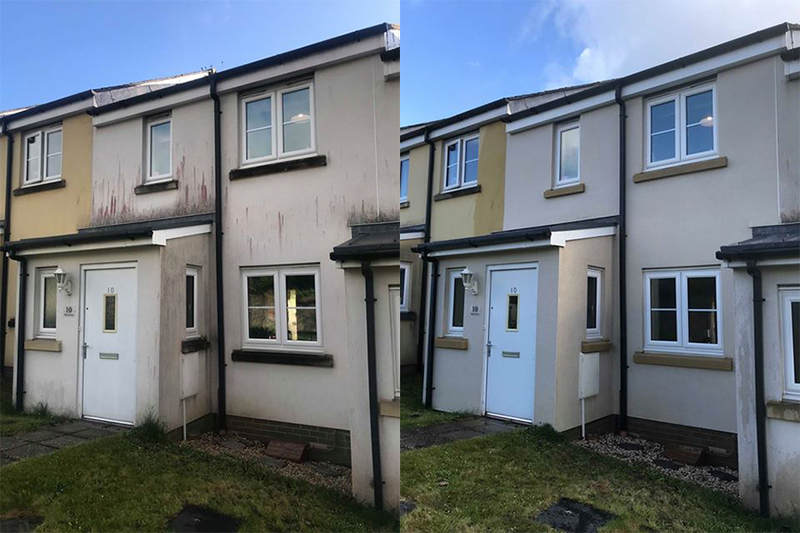 At Bishop’s Exterior Cleaning, our render cleaning team can treat K-Rend, Weber, Parex, Sto, Monocouche renders and bring them back to close to their original condition, leaving you feeling like you have just had newly rendered walls. Our render cleaning team use a safe and low-pressure wash which is also environmentally friendly when cleaning rendered surfaces. The low-pressure wash stops the possibility of any damage being caused to the exterior surface. During the low-pressure render cleaning we remove all organic matter, dirt and grime and kill off all algae and other infections. We are able to work from the safety of the ground using our specialist high-reach poles. If mechanical access equipment is required for larger buildings, including commercial premises, we provide trained operators at all times and the appropriate high-access equipment, designed for the job at hand. When cleaning building render we only ever use professional grade cleaning products and our team are all fully trained in the use of any cleaning solutions and equipment. As well as cleaning render, we also clean K-rend. Our experienced team of K-rend render cleaning experts will remove those unsightly algae, moss and mould stains as well as any other organic matter without damaging the render on your building. We are able to clean any K-rend rendered exterior, giving it that new look again, without the need for any high-pressure washing. We use a delicate but powerful Softwashing method that gives an outstanding render clean for your property. Our K-rend cleaning process always delivers high-quality results on any facades and buildings we treat. Once you have had your render cleaned by us your building will be safeguarded against any future build-up of organic material for some time to come.